Off to a great start when my grandson greeted the discovery of some gluten free bread in a bag for him with a loud shout of “Great, that`s my favourite”. After a breakfast of scrambled eggs on toast with ham and tomatoes, (with toast and jam to follow) we were off. Off to the bus-stop on a “Double or dawdle” basis we got the Stagecoach 700 after about 30 mins. A very busy day as normally I`m the only person rather than the twelve in the queue, ..and then we were off to Brighton. First stop Palmeira Square. “There it is “ was the cry. We walked down to the promenade and then towards the pier. The playground on the beach provided an excellent break as the kids ran and ran around the facilities and slides, whilst we had a lovely cup of coffee. 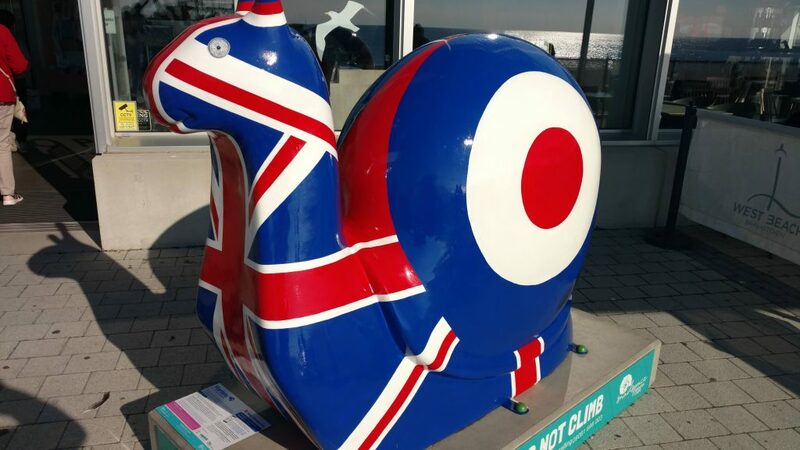 “I can see it” and off they ran to the next snail… The British Airways Union Flag. Shrieks of joy. 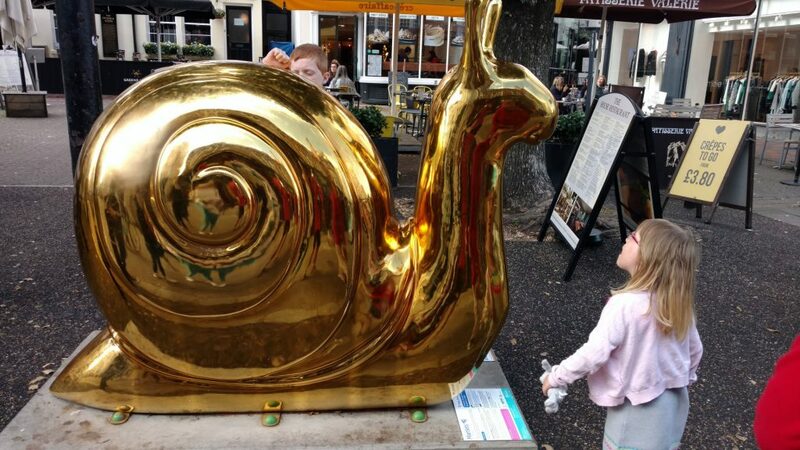 Quickly followed by the Ice Cream Snail with kids licking it! Then off again. Gales of laughter.Up to the one opposite the Hotel, Metropole, “There it is – run Finlay” came the cry and they were off again. Then down again for the Grand Hotel and the Fishermen`s Museum and the one by the Carousel, one looking like sand plus a bicycle leaning against it. (Seemed symbolic to me as a mere pedestrian. Next up to Brighton Town Hall and along to Donatello`s restaurant, with a snail outside, and we all had lunch. They looked after us well, three Coeliacs, including our two grandchildren. Finally onto the pier and we found an ice cream and two more snails but no sorbet or fruit lollipop, until we left. Fortunately we found one. Then down onto the beach and a sit down, only for ten minutes. Then it was home time, via Churchill Square,and then the bus home… to another meal for the kids and a stiff drink for us after they had left. A great day for everyone and particularly for me. I am delighted I was able to contribute successfully to the day. 15,000 paces (7 miles) for us and double that for Willow, our 4 year old granddaughter. By the way I have had AMD for eight years.